After work Justin and I made our way to north Seattle’s finest breakfast establishment, Cyndy’s House of Pancakes. Skirting the Rock n’ Roll marathon and Vintage Car Show, after an hour we found ourselves only in Ballard. As we finally turned onto 85th the air-conditioning finally burst a blood vessel in my nose. I tilted my head back to avoid bleeding all over my new Sounders sweatshirt, and Justin handed me the only piece of tissue in the car- the napkin from our morning donut. My throat filled up with blood, and I started to choke. I leaned forward coughing up blood and bleeding profusely out my nose. Justin pulled into the 76 station to get tissues, and a bottle of Fiji water to rehydrate me. I applied a fresh wade of tissues to my nose, and we continued north for some of the most delicious pancakes I have ever known. In Cyndy’s gravel parking lot I washed my face with the bottle of Fiji water, and we headed in to one of Cyndy’s red vinyl booths. Justin decided to switch up his usual corn cakes, and went with the classic buttermilk with a side of bacon. 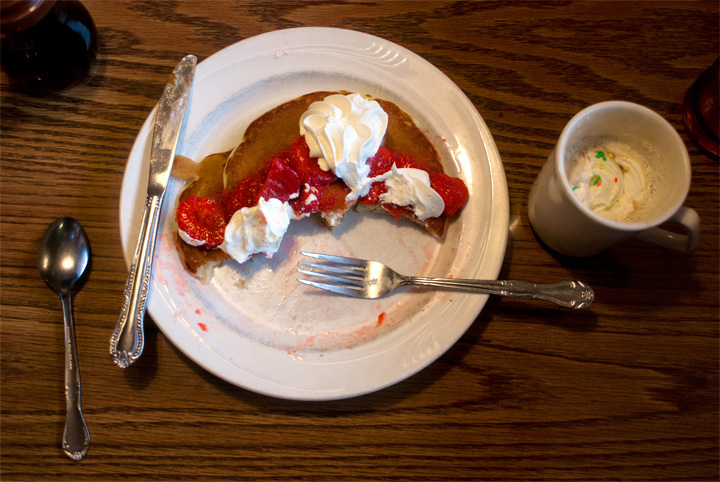 Since it was Saturday Splurge Day I wanted to go big, so ordered the strawberry pancakes with whipped cream. 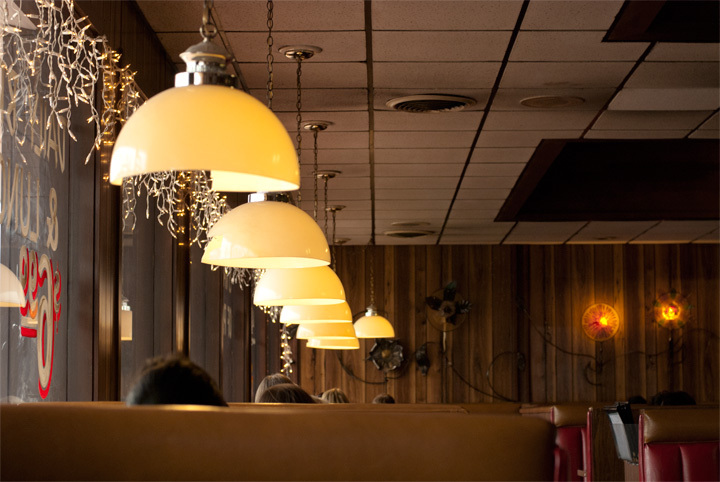 Our waitress smiled a happy cracked out grin, and clenched her jaw. 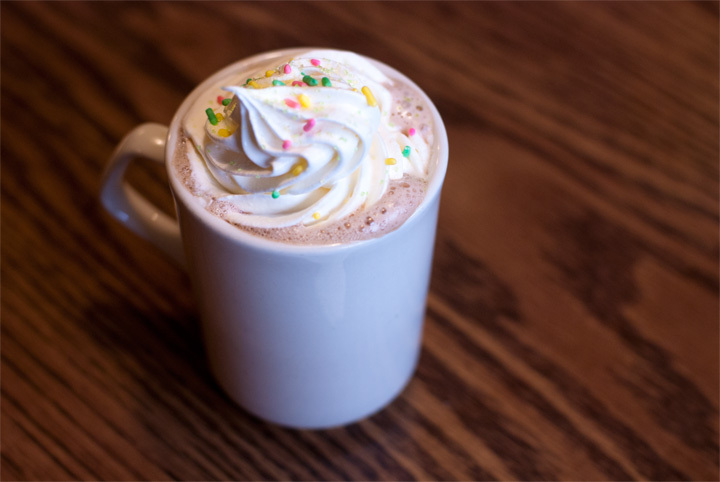 I felt the pressure of her up selling to order more than just a giant plate of dessert for my lunch, and decided my side would be hot chocolate, yes please to more whipped cream. While we waited for our food, my mom dropped by the restaurant. She had been shopping in the area, and had been kind enough to pick me up some supplies; sheep milk yogurt and half and half from Whole Foods. She bid us goodbye as our food arrived, shooting me and my strawberry cream pancakes an ‘I don’t understand why you’re eating that’ look. Justin and I reveled our food, fought over the check (I lost), and joined the masses on the freeway. Eating way too much sugar in the middle of the day, always puts me in the mood. After a quick trip to the restroom, I pulled Justin onto his bed for kisses and more, ehem…. cream. We collapsed happily into a pile limbs, and I felt sleepiness overtake me into a late afternoon nap. Justin covered me with the zebra blanket, and slipped off to work.